Ready to scale a craggy cliff just to be by your side, this adorable plush mountain goat clip-on hooks easily to your backpack, key ring, belt loop, purse, etc. so he can go where you go. This cute little mountain goat stuffed animal clip-on is sure to delight with its soft white and fluffy fur, black horns and hooves, and black eyes in a sweet face. 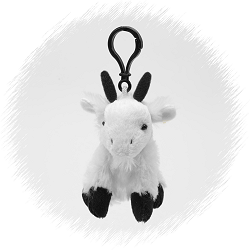 This mountain goat plush clip-on is the perfect take-along pal and would love to accompany you on your imaginative adventures whether it is on your belt loop, backpack, or even just looped around your finger. 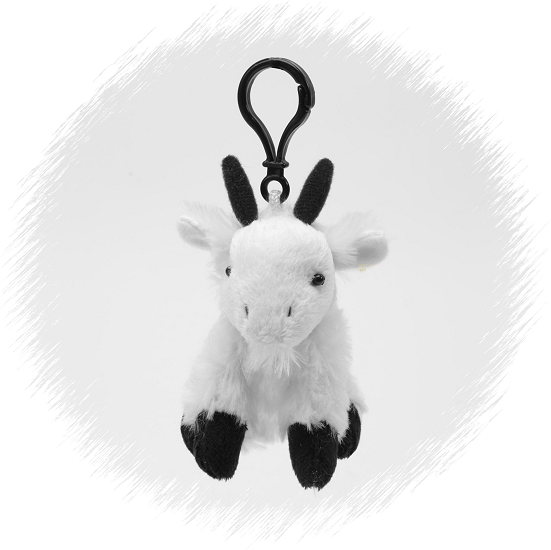 The fun little plush mountain goat clip-on is also perfect for birthday treat bags and giveaways. This sweet plush polar bear clip-on has soft white fur, an embroidered nose, and sweet eyes. This adorable plush red panda clip-on has soft rust, black, and white fur, a ringed tail, and a sweet face.